The Obama Administration Is Restarting Immigration Raids, but to What End? One absolutely guaranteed consequence of these enforcement actions is that they whip immigrant communities in the US into a terrified panic. The Obama administration is not done rounding up families of newly arrived Central American migrants. Five months after his administration conducted holiday raids on immigrant homes in Georgia, Texas, and North Carolina, President Obama plans to revive his targeted enforcement actions with a series of raids this spring, Reuters reported Thursday. As always, there are humanitarian (one might even say moral) concerns with how such enforcement actions will affect the people who’ve fled their home countries for the United States. And then there are the political concerns. The month-long raids, Reuters reported, will take place in May and June and, if they’re like the raids which took place in early January, would likely target newly arrived migrants from Central America who immigration officials have deemed ineligible for humanitarian relief. The raids are widely considered a response to a renewed uptick in border crossings by migrants fleeing El Salvador, Guatemala, and Honduras, where forced conscription into gangs, rampant sexual violence, and the world’s highest murder rates have pushed tens of thousands to flee their home countries. 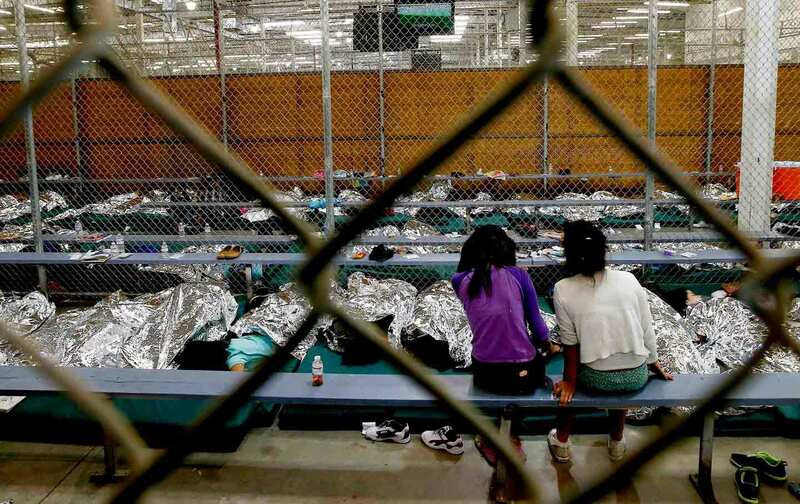 The height of the crisis came in the summer of 2014, when some 65,000 children arrived at the US-Mexico border and presented themselves to Border Patrol agents with the hope of applying for asylum. The numbers of children and families arriving at the border eventually tapered off, but jumped again in the final months of 2015. In November and December of last year, 6,471 and 8,974 children traveling with family members were apprehended at the border, respectively. Those numbers were three and four times the apprehensions for similar months in prior years. After a sharp drop in January of this year, the numbers of border apprehensions are again climbing. In other words, the United States likely hasn’t seen the last of this humanitarian crisis. The raids have multiple audiences: They’re, on one hand, intended to discourage those in Central America from trying to make it to the United States. The US government has also backed PR campaigns—including the production of a pop song called “La Bestia,” or “The Beast,” the nickname of the often-fatal freight trains that migrants ride north from Central America through Mexico. The song warns of the hazards of migration. The raids are but another part of the US government’s misguided PR campaign. But, it’s also 2016, the year of Donald Trump, the year of the proposed border wall that Mexico will oh so surely pay for. There is a domestic audience the Obama administration has in mind. (After all, if the Obama administration’s first-term deportation agenda was, as Hillary Clinton herself has noted, intended as a down payment toward securing comprehensive immigration reform—and look how well that turned out—there’s surely a political motivation for the holiday and planned spring raids.) Consider, perhaps, that this is the Obama administration’s attempt at an intervention in an election year that has been defined by immigration. The apex of the child migrant crisis in 2014 came in June and July—the height of summer. Spring raids now could possibly head off an influx that’s to come. But it’s a political risk; attempting to tamp down a potential summer surge in new arrivals at the border (do imagine for a second how Donald Trump would handle that aerial footage) by raiding homes in the United States in the coming weeks may or may not prove successful. And one absolutely guaranteed consequence of these enforcement actions is that they whip immigrant communities here into a terrified panic. In the wake of DHS’s January raids, school districts in Maryland reported that parents were keeping their children home from school, too fearful that their children would be taken from them. The fear reaches far beyond just those who are the stated targets of the raids. In the weeks after the January raids, the National Immigration Justice Center’s director of legal services, Lisa Koop, spoke of a client who lived with an undocumented family member who was in the midst of an asylum hearing process—and would under the stated terms of the raids not be subject to enforcement. The client and her relative had received a removal order for someone who had lived there, but who had since moved away. “She was very concerned that a prior tenant would prompt ICE to come to her home and her family member would be a collateral arrest,” Koop told me in February. Conducting immigration raids as a political maneuver is a tricky business. Hillary Clinton has made protecting President Obama’s legacy a central theme of her campaign. On immigration, she often counts his landmark executive actions benefiting millions of undocumented immigrants—one of which awaits a ruling from the Supreme Court—as among the achievements she’d protect. On Thursday evening Clinton kept her distance from Obama. “I’m against large scale raids that tear families apart and sow fear in communities,” she said in a statement. “Families fleeing violence in Central America must be given a full opportunity to seek relief,” Clinton said, calling for a policy that would give all unaccompanied children access to counsel. If politics is the primary game the Obama administration is going to play, it’s not just Donald Trump and those who would vote for him that the Obama administration should worry about. Immigration raids strike fear into families, and deportations will send hundreds back to the very harrowing conditions they’ve fled. Raids may also do just as much political harm as they are attempting to prevent. Immigrants and Latinos vote, and—what ought to be just as scary—often choose not to vote.